Thanksgiving is one of my favorite holidays as it’s a time to enjoy with friends and family over great food, conversation, and football! 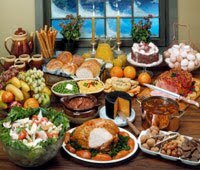 Did you know that the average American will consume 3,000 calories at the Thanksgiving dinner? Furthermore, we know the indulgences can continue throughout the holiday season for many. My motto when it comes to food around the holidays is moderation as there is no such thing as “good” and “bad” foods. Tip 1: Pick high quality ingredients to use in your cooking and baking like the O Organics line exclusively available at Albertsons and Safeway. With O Organics it’s easy to incorporate organic items into your holiday baking without a lot of time, money or effort. One of my all time favorite holiday desserts is gool ole’ pumpkin pie with a dollop of whipped cream on top. Honor and enjoy your craving for a slice of pie because if you deprive yourself, you might very well go back in the kitchen at midnight and eat the entire pumpkin pie. Tip 2: Incorporate fruits and vegetables into your Thanksgiving Day feast such as Libby’s Vegetables as they add great flavor, texture, and nutrition to seasonal favorites. A recipe I currently love is “Glazed Carrots with Spicy Pecans.” You can find this yummy recipe at www.getbacktothetable.com. Make sure to click on the following link www.getbacktothetable.com/cansgiving where fans (like you!) have the chance to win a $350 e-gift card and an assortment of Libby’s fruit and vegetable products. Each winner will also be able to select one of three charities who will receive a matching monetary and prodcut donation. Tip 3: Snack with awareness. Snacking is not a forbidden word and is encouraged. Make sure your snack includes a source of protein as this vital macronutrient helps satiate your appetite. One of my favorite snacks to munch on is a small handful of nuts. Check out this delicious recipe “Sweet and Crunchy Nuts” found at www.splenda.com/naturals. This recipe contains SPLENDA® Naturals Stevia Sweetener. Unlike other stevia sweeteners you may have tried, SPLENDA® Naturals has no bitter aftertaste and gets its sweeteness from a stevia leaf extract and erythritol and is non-GMO. There are also no added flavors or colors, no calories, or atificial ingredients. Tip 4: You will need to tune into Sonoran Living on Wednesday, November 8th from 9-10am on ABC, Phoenix where I will be sharing these tips and one more! This article is sponsored by the following: O Organcis®, Libby’s Vegetables, SPLENDA® Naturals. Next post: Have you heard of Health at Every Size?